जोन डाल्टन सन् १७६६ सेप्टेम्बर ६ तारिखमा बेलायतको कम्बरल्यन्डमा अवस्थित इगल्सफिल्डमा क्वेकर भनिने एउटा क्रिस्चियन परिवारमा जन्मिएका थिए । The son of a weaver, he joined his older brother Jonathan at age १५ in running a Quaker school in nearby Kendal. Around १७९० Dalton seems to have considered taking up law or medicine, but his projects were not met with encouragement from his relatives — Dissenters were barred from attending or teaching at English universities — and he remained at Kendal until, in the spring of १७९३, he moved to Manchester. Mainly through John Gough, a blind philosopher and polymath from whose informal instruction he owed much of his scientific knowledge, Dalton was appointed teacher of mathematics and natural philosophy at the "New College" in Manchester, a dissenting academy. He remained in that position until १८००, when the college's worsening financial situation led him to resign his post and begin a new career in Manchester as a private tutor for mathematics and natural philosophy. Dalton's early life was highly influenced by a prominent Eaglesfield Quaker named Elihu Robinson, a competent meteorologist and instrument maker, who got him interested in problems of mathematics and meteorology. During his years in Kendal, Dalton contributed solutions of problems and questions on various subjects to the Gentlemen's and Ladies' Diaries, and in १७८७ he began to keep a meteorological diary in which, during the succeeding ५७ years, he entered more than २००,००० observations. He also rediscovered George Hadley's theory of atmospheric circulation (now known as the Hadley cell) around this time. 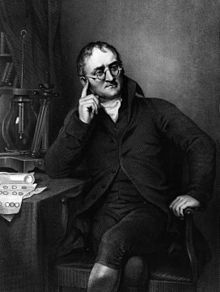 Dalton's first publication was Meteorological Observations and Essays (१७९३), which contained the seeds of several of his later discoveries. However, in spite of the originality of his treatment, little attention was paid to them by other scholars. A second work by Dalton, Elements of English Grammar, was published in १८०१.